Daniel Raim had a goal in mind when he set out to make a documentary about two unsung Hollywood legends—Harold & Lillian Michelson— give these two talented people the credit they deserve. Movie fans are familiar with the work of Harold and Lillian Michelson, even if they don’t recognize the names. 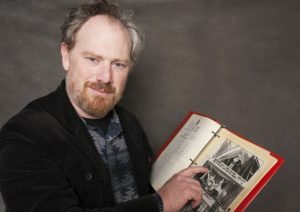 You see, they worked mostly uncredited on Hollywood films, however, storyboard artist Harold and film researcher Lillian left a time-honored mark on classics by Mel Brooks, Alfred Hitchcock, Stanley Kubrick, Mike Nichols, Steven Spielberg, and many more. Stitched together by love letters, film clips, storyboards, and open conversations with both Harold and Lillian, along with Danny DeVito, Mel Brooks, Francis Ford Coppola, and others, this love letter to the Michelsons is not only a deeply moving portrait of love, but a tribute to their work that shaped many of the classic films we all know and love. 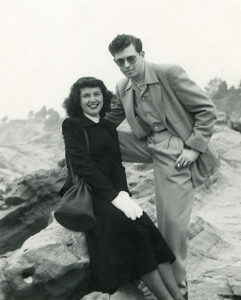 Lillian and Harold Michelson in Los Angeles in December 1947 in Daniel Raim’s HAROLD AND LILLIAN: A HOLLYWOOD LOVE STORY. A Zeitgeist Films release. Photo: Adama Films / Zeitgeist Films. Sarah Knight Adamson: I want to tell you out of the gate, I totally love your movie so much. I’m very happy that you made this movie, because you’ve documented these two lives. Not just one life; two of these amazing film legends. You’ve shed tremendous light on the artistic side of filmmaking that frankly enhances the viewing experience not just for film critics, but for the whole world. I applaud you for that. Daniel Raim: Thank you very much. SKA: Can you talk briefly about your beginnings as a filmmaker with, I believe your teacher at the time, Robert F. Boyle? DR: This was 1997 and I was a student at the American Film Institute. My professor was Robert Boyle. He was 90 years old at the time. He was also the subject of my first documentary. 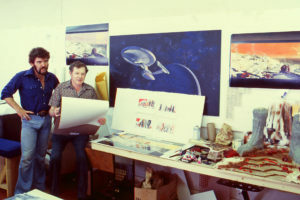 Harold Michelson (right) in the Art Department at Paramount Studios in 1978 working on Star Trek: The Motion Picture in Daniel Raim’s HAROLD AND LILLIAN: A HOLLYWOOD LOVE STORY. A Zeitgeist Films release. For hi-res downloadPhoto: Adama Films / Zeitgeist Films. SKA: Can you talk about how, during the making of a film, it’s less about making sets that looked real, but more about the storytelling. I guess in my mind, I think of The Graduate, and that iconic leg. Is that real? Is she [Anne Bancroft] really going to just sit there and pose like that? Probably not in real life, but it tells a story. 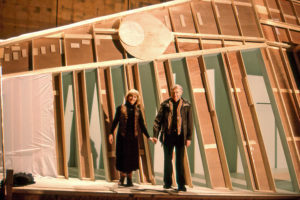 DR: Sure, especially around that time, there was a sensibility or an approach to set design that incorporated a sort of a theatricality in terms of how sets were designed. Like in the apartment, a sort of forced perspective of that office space going off into infinity. In Hitchcock’s movies, or in one of Harold Michelson’s favorite films, Armorcord by Fellini, which had all these sorts of magical tricks that when you look at it, he created an ocean out of plastic wax bags. Plastic bags. It so shocked Harold. He was so moved by it. Today, everything is all visual effect. That’s what audiences are expecting, but there was kind of a semi-unique quality to that specific style of set design and visual storytelling. SKA: Can you give us any insight from Robert F. Boyle about Alfred Hitchcock as a filmmaker that possibly we may not know? Or some insight that you gained? DR: Well, the big takeaway was that how supremely collaborative Hitchcock was. That the behind the scenes, some sort of filmmaking process was that he had the luxury of having a contract at Universal that he could gather all his key talents around meetings long before the script was written, which is sort of unheard of today. 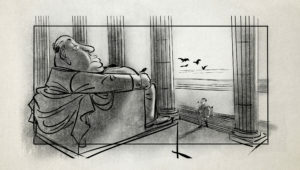 DR: They would articulate his [Hitchcock’s] vision to everyone from his costumer editor, production designer, Harold was there, storyboard artists, cinematographers. I mean, even the back painters. They were all in that room; all key heads of these departments. All focused on developing a very organic meaningful way, and enhancing Hitchcock’s vision. He was very collaborative, but he also surrounded himself with the greatest cinema artists available at that time, including Robert Boyle, who was not just a talented sketch artist or a talented architect. But he was a storyteller. They were all storytellers, and they were all enhancing Hitchcock’s vision through their own talent. SKA: Yes, I learned so much from this movie about Hitchcock because I actually thought that Hitchcock drew all his own storyboards. I had no idea. This was a real eye-opener to me. I went back and studied Hitchcock’s storyboards and Harold’s, and yes there’s a big difference. I can see it now. It’s so cool. Thank you for that. llustration by Patrick Mate in Daniel Raim’s HAROLD AND LILLIAN: A HOLLYWOOD LOVE STORY. A Zeitgeist Films release. Photo: Adama Films / Zeitgeist Films. SKA: Could you talk about the one thing that really is unknown to most people; the amazing leg shot of The Graduate. Can you tell us about how that came about? DR: Sure. Harold’s concern in doing the storyboards for The Graduate was to make it visually compelling, so that what he did was basically take the words on a script, which is essentially a kind of interior Mrs. Robinson’s living room, that dialogue. You know, Mrs. Robinson at the bar, then standing somewhere in the living room. They’re having this conversion. Harold’s job at that time was to come up with interesting shots and how to make it so that it’s not just two people talking in the room. Then you cut in between them. In this specific instance, he was interested in how did he convey the sexual tension in a visual way. DR: The idea of a triangle came up into his mind. He thought of making Mrs. Robinson’s leg in the shape of a triangle. Then we see her sort of sitting at the bar. She raises her leg. Then he saw the triangle in the camera of the leg. SKA: I can’t believe it. DR: There is his storyboard. I mean, it just so happened that the director, Mike Nichols, and the cinematographer really appreciated Harold’s storyboards so much. (This is rare what I’m about to say, but they literally set up the camera every shot in that film based on Harold’s vision) Not only that, but Harold even articulated the tilt of the camera, the height of the camera, and how far it is away from the action. SKA: Wow! He really was a genius in his craft. SKA: How in the world you found that photo, which I thought was so powerful, of Harold on set. They have a mattress with Ann Bancroft and Dustin Huffman rehearsing. How did you get that photograph of Harold on set? Where’d you find that? DR: A very funny story connected to that photograph. I was at the Academy Margaret Herrick library archives. The very last day of editing before we had a picture walk for the Cannes Film Festival. DR: The last day, I had to find a high-resolution version of that photo that I’ve been using this whole time, but it was from another angle. I couldn’t find it. The Academy had from that very same day a different angle. I was reluctant. I got the license to that photo and put it in the movie. Just as we were picture-locking, my wife, who’s a co-editor, very talented co-editor, said, “Hold on that frame. Who’s that in the middle?” I zoomed in 400%, and sure enough it was Harold with his pipe, story-boarding the scene as Mike Nichols was rehearsing. For us, that was the smoking gun. DR: Because it’s nice to have Harold say, “I was there,” but to actually see it. SKA: Yes, to have the proof. DR: Either way, it felt like, honestly, it felt like Harold saying hello. On the other side, coming to say hello as we were finishing the film, it was a pretty powerful moment. SKA: That’s so cool. Thank you for sharing that. You teach us in the film about storyboards. Of course, their practical purpose, but they’re also art themselves. Do you think we’ll ever see storyboards in museums next to art sketches or film sketches? DR: It’s a good question. I don’t know. I think they should be because some of the storyboards, and not just storyboards, but the concept art for movies is as rich and as evocative as any other kind of graphic art that I’ve seen. Its function was to convey information and emotions to other departments. DR: Not as art, but the fact is that these are very important tangible works of art. I mean, conceptually, but there’s also something to add to that. If you asked Harold about his craft, he would say it has that it’s not about style. It’s about ideas. The style is almost second. It’s just sort of a function. But the idea is really what’s important. DR: With that being said, I’ve seen some amazing style. SKA: You probably have with just researching this film. Lillian’s life story is so endearing. She’s such a wonderful asset to any film that she was a part of. Were there any particular films that she was most happy about in terms of her research? Lillian Michelson in the Lillian Michelson Research Library at Paramount Studios in 1996 in Daniel Raim’s HAROLD AND LILLIAN: A HOLLYWOOD LOVE STORY. A Zeitgeist Films release. Photo: Adama Films / Zeitgeist Films. DR: Her favorite film is Fiddler on the Roof because it brought her deeper understanding about a religion that she was born into but knew nothing about. DR: Yes, she encouraged him to do the movie so she could do the science fiction research. 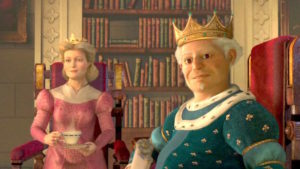 SKA: Can you tell us about Harold and Lillian as king and queen of Shrek movies came about? DR: Well, Lillian had already been about five years with Dream Works at that point. Her library had already been situated or relocated to the Dream Works animation studio lot in Los Angeles. Harold had an office there. All the artists would come and visit with Harold and spend time with him. Kind of sit at his feet, as Lillian was saying the other day. I think that somehow or another, the screen play for Shrek, the screenwriter and the director and other artists working on the movie wanted to honor the two wonderful people. That they felt one way to do that was to name the king and queen after them. SKA: Patrick Mate, the animator for the Harold and Lillian sequences, I have to tell you that I really love those. I just feel they added so much to your film. Can you talk about him and your collaboration on his storyboards? DR: Yeah. I was really pleased to have the opportunity to work with Patrick, who’s an immense talent. He’s a senior animator at Dream Works. He brought so much to it. 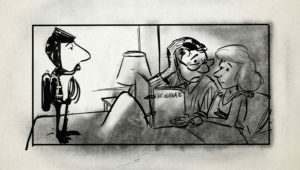 In fact, one of our goals in creating these storyboard-esque illustrations was to underscore Harold’s world view of him and his wife Lillian. At least what I interpreted as the way they approached life with grace and wit and love. Patrick was really able to define these moments in a single frame. It was also an opportunity to use Harold’s own technique in telling a story to our audience. SKA: Yes. It was perfect. Is there anything else you’d like to say about the film? DR: Yeah. I think that in addition to being a very moving and inspiring human story, I think that my hope is that this film will enlighten film audiences and also historians to recognize Harold Michelson as one of the greatest cinema minds of the 20th century. Someone who was never credited on The Birds or The Graduate, but those films would not have looked the same or felt the same without his contribution. DR: Her very very detailed and accurate research really lent a kind of a grounding and authenticity to so many films that we know and love. DR: I hope that this film redefines our understanding of how movies are made and why they’re so wonderful. How these classics made such an impact on them. 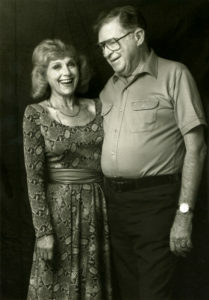 Lillian and Harold Michelson in Toronto in November 1994 on the set of Intersection in Daniel Raim’s HAROLD AND LILLIAN: A HOLLYWOOD LOVE STORY. A Zeitgeist Films release. Photo: Adama Films / Zeitgeist Films. SKA: That’s fantastic. Thank you so much and best of luck with the film!